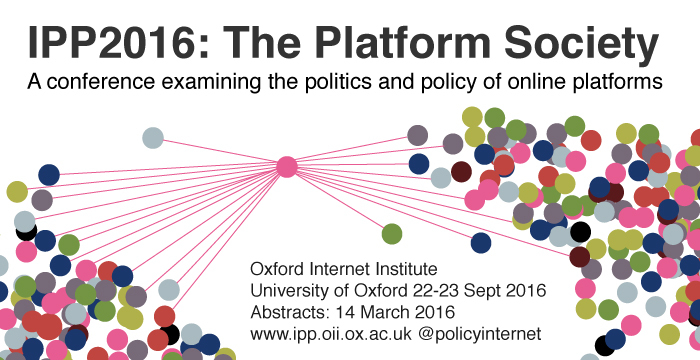 This is the fourth conference of the journal Policy & Internet, convened by the Oxford Internet Institute (OII) in collaboration with the European Consortium of Political Research (ECPR) standing group on Internet and Politics. Andrea Calderaro (Cardiff University / ECPR). Large scale internet platforms such as Google, Facebook, Amazon and Uber play an increasingly important role in contemporary society. These platforms facilitate connections between friends and family members, between consumers and producers, between voters and politicians, and between employers and employees. As such, they are becoming venues where large segments of contemporary life are played out. The data collected and in some cases made openly available by these platforms creates huge opportunities for advancing research in many fields of social science. Exciting advances have already been made in understanding, for example, how information spreads across networks and the importance of social influence on personal action. Yet researchers have only scratched the surface of the possibilities offered by new data sources and analysis methods. At the same time, the decisions made by these platforms increasingly shape contemporary life. Whether taking employment through Upwork, purchasing goods on Amazon, seeking information via Google, remitting money via PayPal, or debating politics on Twitter, our actions are enabled and constrained by sophisticated algorithms and company policies. The decisions, assumptions and interests reflected in these algorithms and policies have potentially very significant consequences to society at large, yet detailed understanding of these processes is still very limited. Paper proposals should consist of a title and a 1,000-word extended abstract that specifies and motivates the research question, describes the methods and data used, and summarises the main findings. Abstracts will be peer reviewed, and the authors of accepted proposals are expected to submit full papers prior to the conference. Applicants will have the opportunity to co-submit their paper to the journal Policy and Internet, which will operate a fast-track review process for papers accepted to the conference. Paper submissions can also be considered for a Best Paper Award (sponsored by the journal Policy and Internet). The prize will be awarded at the closing session of the conference. As the paper is intended to be published in a future issue of the journal, authors should indicate whether they would like their paper to be considered for the prize. Posters should summarise in a visually engaging manner the purpose, methods and results of an original piece of research. All accepted submissions will be considered for a Best Poster Award. The prize will be awarded at the closing session of the conference.